A healthy and refreshing entree that’s great for low carb and gluten free diets. In a glass bowl, put the mangoes, cucumbers, ginger, lime juice, olive oil, cilantro, salt and pepper; toss to combine well. Set aside while you grill the scallops. Lay scallops out on a work surface and dry with paper towels; sprinkle with salt and pepper on both sides. 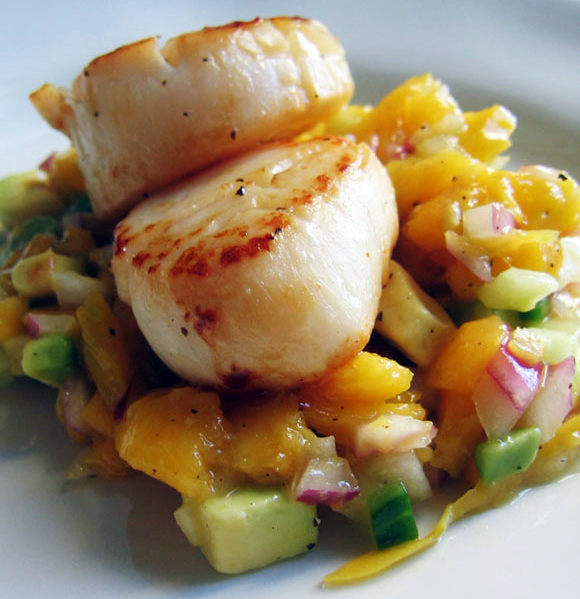 Grill scallops either inside or outside – if inside put a little olive oil in a ridged grilling pan over medium-high heat. When hot, put scallops in, cooking until seared well, then turn and cook the other side. They should be good and golden brown and cooked through. This should take 2 to 3 minutes on each side, depending on the size. Spoon generous portions of the salsa on serving plates, then arrange scallops on top of each plate. You can extend this meal with rice, depending on your diet.